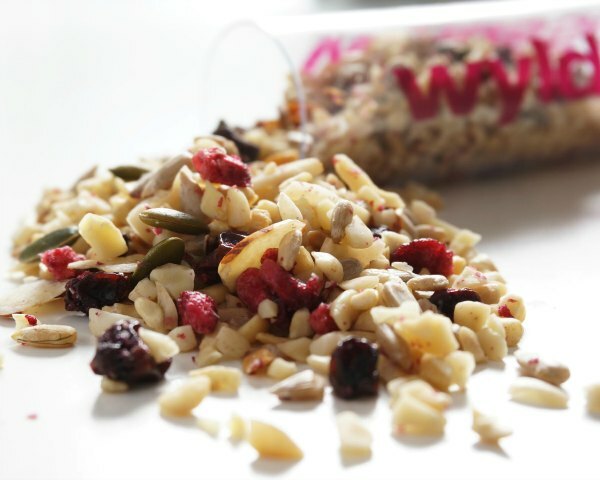 Our ProMixes are made with nuts, seeds and fruits. But should you snack on this sort of stuff? Is it healthy? Nuts and seeds contain lots of natural plant protein, which is a fundamental building block of our bodies. Nuts have a Glycemic Index-lowering effect, slowing digestion and the release of glucose into the blood stream. ProMix is therefore a sustaining source of energy, without the sugar spikes. Fibre is an important part of a healthy balanced diet. It can help prevent heart disease, diabetes, weight gain and some cancers, and can also improve digestive health. Nuts and seeds satisfy hunger and reduce appetite – the protein, fibre and fat all act to control appetite and food intake. Dried fruit actually retains most of the nutritional value of fresh fruits, and so is an important source of vitamins, minerals and fibre in the diet. A 30g portion of dried fruit counts as one of your 5-a-day. People who eat nuts as part of a heart-healthy diet can lower the LDL or “bad” cholesterol level in their blood and so lower their risk of heart disease. People who eat nuts regularly have lower rates of heart disease. Not all fat is bad. The unsaturated fat found in nuts is an important part of our diet that’s needed for energy, essential nutrients that our bodies cannot make themselves. Nuts & seeds are cholesterol free. There is increasing evidence to suggest that diets higher in plant-based foods result in less lifestyle diseases (obesity, diabetes, heart disease etc). 9. ProMix is a great source of antioxidants, vitamins, minerals and phytosterols. Nuts, seeds and dried fruits are all packed with lots and lots of healthy stuff which is just so important in keeping your body healthy. You certainly don’t get this stuff from donuts or highly processed protein bars. Studies find that eating nuts does not lead to weight gain and may instead help with weight control, perhaps because nuts help people feel fuller and less hungry. People who eat nuts regularly actually tend to be leaner than those who don’t. BTW – we make the best trail mix in the world. Mozaffarian D, Hao T, Rimm EB, Willett WC, Hu FB. Changes in diet and lifestyle and long-term weight gain in women and men. N Engl J Med. 2011;364:2392-404. Bes-Rastrollo M, Wedick NM, Martinez-Gonzalez MA, Li TY, Sampson L, Hu FB. Prospective study of nut consumption, long-term weight change, and obesity risk in women. Am J Clin Nutr. 2009;89:1913-19. Bes-Rastrollo M, Sabate J, Gomez-Gracia E, Alonso A, Martinez JA, Martinez-Gonzalez MA. Nut consumption and weight gain in a Mediterranean cohort: The SUN study. Obesity (Silver Spring). 2007;15:107-16. Mattes RD, Kris-Etherton PM, Foster GD. Impact of peanuts and tree nuts on body weight and healthy weight loss in adults. J Nutr. 2008;138:1741S-5S.